Whew I’m beat! Doing nice things really takes it out of you. This weekend was full of niceness so let’s get right to it. #17 – Sudoku for Dad. My dad likes Sudoku puzzles. He sits in the living room or in the backyard on the porch swing and works on them for hours. They would make me crazy! Most Sudoku books are set up so they include easy, medium, and hard puzzles. A new book means new easy puzzles which, if you are my dad, can be done in pen. Apparently using a pen is quite the test of your Sudoku skills. I picked up a Sudoku book at the dollar store last week and stuck it in the mail along with a little note. #18 and #19 – Flowers in the mail. Do you know who likes flowers and frilly stationary? Two of my aunts! I sent them each flowers. Well, I sent them infant flowers in the form of seeds. According to the chart on the back of the packages my aunt in Santa Cruz can start planting right away while my aunt who lives outside of Portland will have to wait a few months. Hopefully it will add more color to what can already be considered two very colorful gardens. #20 – Shopper help. While at the grocery store, Ralphs, on Friday I helped a gentleman find the popcorn. Since the popcorn is in the same aisle as the soda, chips, sparking water, and Propel it is an aisle that I’m intimately familiar with. I like to call it the best aisle in the grocery store! #21 – Man down. Yesterday was a doozy of a day! I got up early to start prepping for my tea party (see good deed number 22) and had most of the day planned down to the minute before quests arrived. Unfortunately, the main sewer line decided this would be a good time to back up. That meant an emergency call into the plumber and me having to drive to McDonalds to use their restroom! 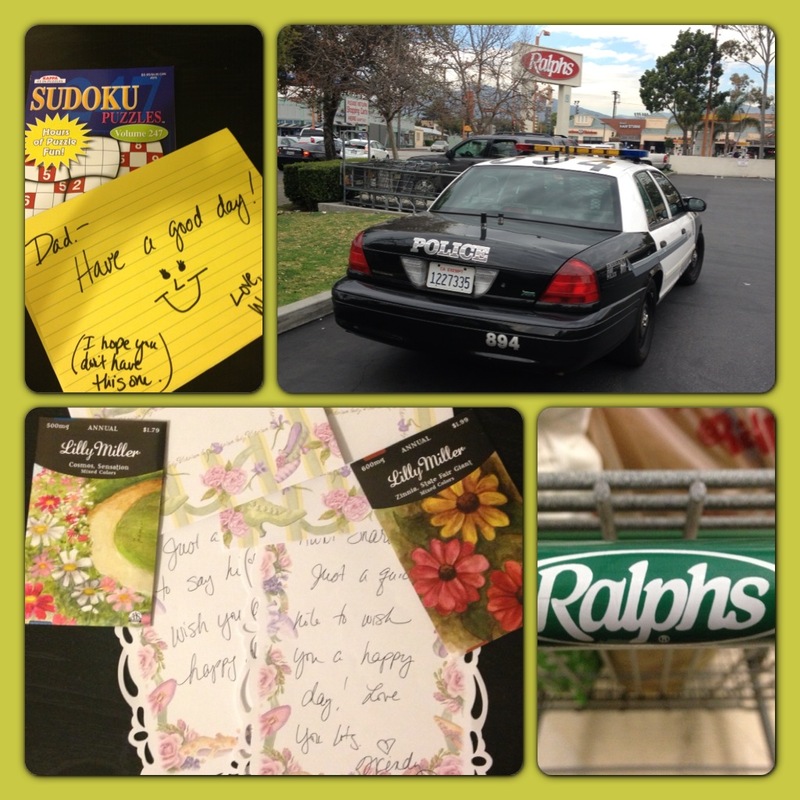 Driving home from my bathroom break I went by Ralphs (same grocery store as good deed number 20). As I was turning the corner I noticed a man who was extremely off-balance and couldn’t catch himself. He went down HARD partially in the planter, partially on the sidewalk, and partially against the tree. As I made a U-Turn to pull into the Ralphs parking lot 2 different people walked right by the guy and did nothing. How is that possible? After parking I ran over to him to see if he was okay. He wasn’t. Apparently he had hurt his ribs earlier and was on pain medication which, according to him, causes problems with his balance. Now his ribs hurt again. Falling in to a tree then onto the ground can do that to you. He insisted he was fine but couldn’t get up past his elbows and while moaning threw up. At that point a couple of women were behind me and asked if they should call 911. I turned around to say yes but they saw him throw up and walked away saying he was a drunk. Now it is possible he was drinking but he didn’t smell of alcohol and could carry on full conversations with me without slurring. He was shaky but not slurry. To me he was showing signs of Parkinsons or something like that. Luckily a man walking his dog stopped a few steps away from us and asked if he should call the paramedics. The poor man on the ground said no while I frantically shook my head yes. The good Samaritan listened to me and immediately got on his cell phone. The poor man on the floor was able to finally sit up but he was pale and still shaking so I sat down with him and we talked until help arrived. I knew he wanted to get up and leave but I really didn’t think he could stand again without falling down. I kept suggesting he should stay sitting for a while longer. I was just trying to buy time until the paramedics came as I didn’t want to have to be the one to try to catch him if he tried to stand up. We talked about how he lived across the street and should have brought his cane along with him. We talked about how responsible it was for him to bring his own grocery bag and how soon it would be the law in the area. He explained that he didn’t like plastic bags and I told him how I used them to pick up my dog’s poop. He didn’t have that same use for the bags as he had a cat. FINALLY every cop and fire truck in the neighborhood (which was 2 fire trucks and 3 cop cars) circled us. As the cop stood there questioning the man I stood up, brushed myself off and explained to the cop that I needed to go. He said that was fine so I shook the man’s hand, who was still on the ground, and the dog walkers hand and took off for my car. Now waaaaaayyyyy behind schedule! The plumber showed up about 1/2 hour before a nice couple dropped off their boxer, Bud. To help make money while I’m looking for a job I signed up as a dog host (dog sitter) on the site DogVacay (http://dogvacay.com/pro/wendyandriggins). Bud’s mom contacted me that morning saying their original sitter was being non-responsive and asked if I could take Bud for a couple of days. I couldn’t say no, so Bud showed up during this chaos. Not the best way to introduce two dogs but after Riggins (7 years old) put baby Bud (2 years old) in his place a couple of times everything was good. #22 – Friendly Tea (with dogs). To show my girlfriends how much I appreciate them I hosted a tea for all. My friends are big planners and I threw this at them with only 6 days notice. Luckily many were still able to clear their calendars and join the fun. In between everything else I did that morning I frantically made cucumber sandwiches (It’s just weird to me how good cucumber sandwiches are. ), chicken salad sandwiches (Recipe found here – http://arismenu.com/cranberry-apple-chicken-salad/), turkey and cheddar sandwiches (Recipe found here – http://www.stonegableblog.com/2010/05/tea-sandwich-recipes.html. I actually served them open-faced on big wheat crackers. Well … because I was sick of making sandwiches. The crackers are delicious. I topped them with scrambled egg whites this morning for breakfast. Also I skipped the poppyseed dressing. ), and mini apple pie bites (Recipe found here – http://pinterest.com/pin/248823948133965180/. These were delicious but looked NOTHING like that picture.). After pulling out and washing my grandma’s good china and setting everything up I was finally ready for guests. 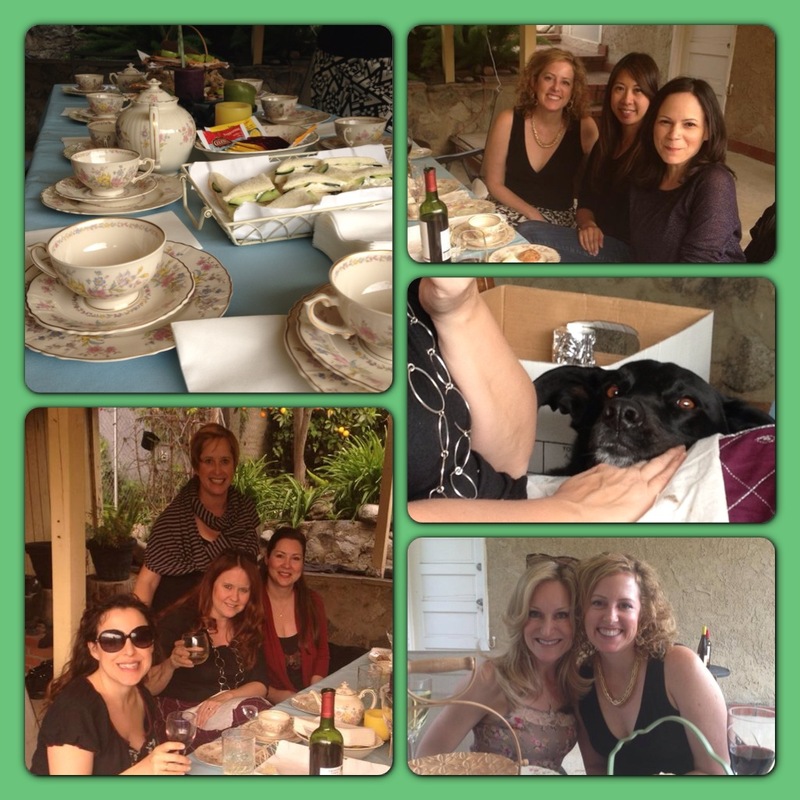 My friends, Anna, Laurie, Cathy, Darci, Tiffany, Stevie, and Lucie along with Bud, Riggins, and Chloe (Darci’s tiny little white dog) sat in my backyard to enjoy tea, small sandwiches, and fun. Based on the day I had I announced that I was going to have one cup of tea so it could officially be called a “tea party” then I was moving to wine. So that is what we all did! Everyone seemed to have fun. Bud spent most of his time under the table or, if Riggins wasn’t watching, in my lap (there was a minor incident of Bud and Chloe making an escape but we won’t talk about that). Riggins sat on the lap of the person with the most food and/or who he felt should be petting him. This included laying his chin on my friend Cathy’s lap until she gave up, and allergies and all gave him a pat on the head. Chloe made her way around to all along with being the most active scavenger. The big dogs had dropped their sweet potato treats and Chloe decided it was her job to find them all for her to enjoy. Seems fair. We all had a great time and there is a push to make this a quarterly event with rotating hosts. I hope your weekend was as fun filled as mine (minus the plumber, the dog escapes, etc. ).